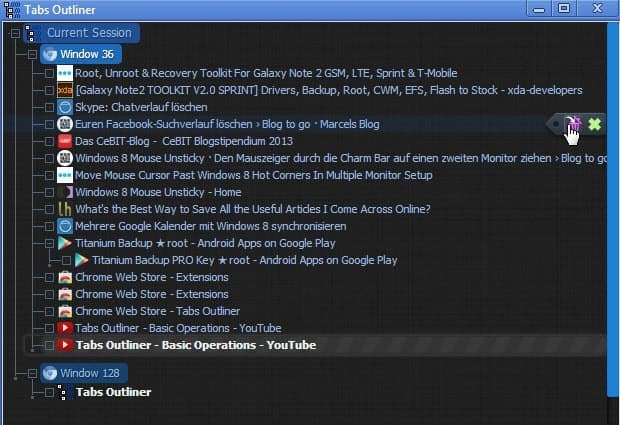 Tabs Outliner: the ultimate Chrome tab management extension? Tabs Outliner is a browser extension for Google Chrome that improves tab management by listing all open tabs on a single page. Tabs are an integral part of all modern web browsers. They enable you to open multiple web pages at the same time in the same browser window. While tabs have been there for years, tab management has not really evolved that much ever since it was first introduced in web browsers. While there have been attempts to remedy the situation, Mozilla's half-baked Panorama or Opera's brilliant tab stacking come to mind, there has not been a breakthrough yet. That does not mean that there has not been any progress. When it comes to tabs, progress comes in the form of extensions for popular browsers such as Firefox or Google Chrome. One popular theme is to move extensions to the sidebar. For Firefox, this is for instance handled by the Tree Style Tab and Tab Kit extensions, while Chrome users can install the Sidebar Tabs extensions instead. Mozilla too has been toying around with the idea of moving tabs to the sidebar, but that is more of an experiment at the moment than anything feasible. Tabs Outliner is a popular extension for Google Chrome that introduces a new approach to tab management. At its core, it is a tab management solution that opens up a tree style view of tabs in its own window. What makes it special is the fact that you can unload tabs in their respective browser window so that they do not appear there anymore. The reference to unloaded tabs is on the other hand still available in the listing of tabs that the extension makes available. Two icons are displayed when you hover the mouse over a web page. There you see an option to close tabs with a click, or to deactivate them. Deactivating removes them from the browser window but not from the tab listing in Tabs Outliner. New tabs that you create are automatically sorted into the structure in relation to their parent tab. Dragging and dropping tabs around lets you handle that operation manually as well. A menu is displayed at the bottom left corner of the tab window that you can use for a variety of purposes. You can for instance drag and drop separators to the tab listing or add notes which are automatically saved by the extension. Here is a demo video that walks you through the basics. The extension has several applications. It can be interesting for users who work with a hundred or hundreds of open tabs in the browser. The main benefit here is to disable tabs that you do not need all the time so that they do not waste space or resources in the browser. You can open the tabs again at any time with a single click. It may also help you concentrate on work by disabling tabs that are open but not work related. That’s the default behavior of links, is not it? You can middle-click them or hold down Ctrl while clicking to open them in a new tab. It is not the default. In almost all sits, blogs… a click on a link opens a new tab. You mean external links? They are adding target=”_blank” to those links. Is that a big issue? I do not notice it at all since I’m always middle-clicking when I want links to open in another tab. Update: Sorry unintuitive and far too complicated. I’m now using Sidewise Tree Style Tabs, although beta its working very well so far. Enable “Tree Style Tab” and “One Click” from the options then close and open the Tab Outliner again. Once you have all your tabs displayed correctly click “Save and close all open windows”. Or use the “x” to “save” them – Yes I know this does not make sense. *** If you don’t then they will all be lost! *** (This should be done automatically, I was caught by this and needed to use Chrome’s restore feature to recover). In Chrome settings “On Start up” set to Open the New Tab page. On opening Chrome click the Tab Outliner button. TabsOutliner have not somewhat more features but a MUCH MORE flexible tree, and this really contribute to usability and advanced possibilities, for example it is possible to put windows inside windows, this allow a full new dimension of possibilities and really much more value, along with really handy ability to perform drags between several views of the same tree scrolled to a different position. Sidewise ability to organize everything above the windows level is actually very limited. One other excellent feature of Tabs Outliner is an ability to make notes for tabs by dragging some selected text from a web page – I use this every day many times, really very handy. Many other small but handy features is absent in sidewise. Actually Sidewise is mostly have a subset of TO features, the only big difference is that it utilize filtered search, instead of highlighted version in TO (need press Ctrl-F in TO window to start search) and really have multiselect, yet actually this is not so much needed if in TO is enabled TreeStyleTab mode (which is recommended) as everything is already grouped most of the time. And TO has plan to add this also of course. This is a tool for everyday use, so there is no problem to invest 10 minutes to read the docs and try to understand everything. And the rants about “too complicated” most likely simple a spam from the author of Sidewise (a Tabs Outliner clone, released 2 month after the release of TO) as it is very hard to imagine that somebody can have problems with actually a paragraph of basics, which are mostly intuitive even without any reading. And many users in reviews really confirm this. Some other things contribute to this version of spam as this review is now cut and pasted over the internet. Sidewise is not more intuitive, it is simple lack the documentation and the features. The Green X looks like a cross in Tabs Outliner because it is primary function is to close the tab. This symbol is used in many places and even in the logo of TabsOutliner, so it will be really strange to use for example a floppy disc for such a function. Sidewise really store last closed windows on Chrome exit in the tree (yet in Sidewise it is more like a list, not a real tree), but this is actually more a problem than a feature, as this will result after a week of use in really polluted by some casual windows and tabs tree (TO leave a window only if it is explicitly saved). Chrome has ability to reopen a normally closed window in last session if this is needed (this can be performed from a new tab, or from tab bar context menu). So why need to duplicate this most of the time not needed information in the tree is not clear, seems reviewer simple comes from Firefox and are not familiar of this concept. This also a reason why Chrome not warn if user close a window with big number of tabs – because everything is EASILY restorable, actualy in a same number of clicks as from Sidewise list. So to store this on a total close yet not to do this on a some regular windows close (as TO do) is definitely inconsistent. Yet need note that in case of Chrome crash TO save everything was open and allow reopening everything from tree, they only don’t do this on normal, user invoked, Chrome exit, so user actually might decide for yourself – they really want save something before exit, or they want simple close and forget all the garbage. – It is use localStorage to store the data of the own list, and unfortunately, a local storage is VERY limited in size, so after a 3-4 months of heavy use somebody might found yourself with not working extension anymore. This is a reason why TO utilize IndexedDB storage, as it is limited only by free space on disc. – The more serious warning is that Sidewise declare access right to access your data on all websites, along with cookies and credentials, and this is, combined with a fact that extension can be updated by author anytime they want, is a big alert actually. Some hacker which will gain control of Sidewise author Google account can gain control on all its users for example. Also this is VERY resources unfriendly, as this will result in embedding sidewise scripts in every open tab. I’ve developed an extension for Google Chrome that helps Chrome users to manage their opened tabs like cards on board, pin important tabs on extra drawer board and search for opened tabs using voice and speech recognition (English & Arabic) in HTML5. The extension now available in Google Chrome web store at the name “Tabs Board” or click here http://goo.gl/GpfZPX to view it in web store, i’ve provided video of installation and how to use. How do I restore into INCOGNITO mode from Tabs Outliner? I will not use google. How can I buy a paid mode with an envelope of cash or paypal?